Medical billing or revenue cycle management is an integral component of practice administration. The better a practice manages its billing, the better it gets paid. Given the regulatory and compliance challenges within the healthcare industry, physicians today are overburdened as it is and thus require an efficient billing manager to manage the day to day operations swiftly. However, most solo practitioners unfortunately lack the resources to employ expert personnel and in such cases have to manage the process themselves. The initial development in health IT was in fact to provide a solution that would resolve the problems associated with medical billing. This is partially the reason why you might find a practice management system but not an EMR in most practices. Payors are not charitable organizations working to make the world a better place; they are businesses developed with the purpose of earning profits. As the healthcare industry rapidly moves towards evidence based practice methods and performance based reimbursement, EMR billing becomes essential. While payors may remain reluctant to reimburse claims, having quality documentation processes will undoubtedly expedite the process. 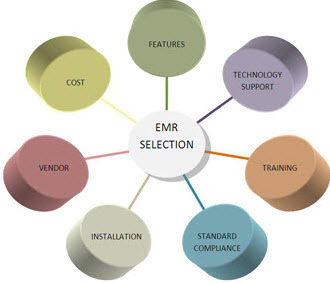 Established EMRs offer e-billing and claim management built-in to their solution with physicians stripped for cash opting to utilize these systems themselves or have the office manager take care of it. While e-billing simplifies the process it can still be taxing, hence outsourcing this process to a team of specialists becomes a viable option. In comparison to having an in-house team, an outsourced billing process does in most cases prove to be more cost effective. In a study by software advice, collections are likely to improve by 10% through outsourcing. While costs may decrease slightly in the initial period, they are likely to equalize to that of employing an in-house team in the longer run. Outsourcing models such as pay-as-you-go are more likely to attract attention, with a fixed percentage of the eventual reimbursement that physicians receive. This ensures that the provider does not have to make payments when short on cash. However, reduced cost is not the only benefit; providers that start up can benefit more from such services as they do not have to recruit their own back office departments. Outsourcing also works for physicians that do not want to deal with the business side of running a medical practice. Lastly, outsourcing eliminates workflow disruption that may occur due to staff turnover. The billing process is likely to become more complex over time, thus outsourcing is likely to become a practical option for practices of all sizes. EMR interoperability is undoubtedly the most popular choice of discussion amongst medical professionals today. In my previous post, I discussed the importance of EMR interoperability across medical organizations and how data sharing could help in improving quality of care. However, this time round I would like to share some thoughts on connected medical devices (CMD) and their role in shaping the future of healthcare across the globe. With the ever increasing demand and pressures of clinical productivity, connected medical devices are a ray of hope for most. Nurses on average are likely to spend over two hours per shift documenting. This reduces the time spent on patient care whilst creating anxiety and stress. CMDs can reduce a significant portion of time that nurses spend while transcribing medical data from devices, with reported saving from one device ranging between 4 to 36 minutes. CMDs also significantly reduce documentation errors and hospitals can prevent up to 800 data collection errors per day. The responsibility of hospitals for collecting and utilizing quality information is now greater than ever, and it is very likely that this will continue to increase in the near future. To meet these regulatory mandates whilst being cost effective, hospitals would inevitably require automation of data collection processes. This is the reason why it is integral for manufactures to standardize the transfer of data from medical devices to an EMR system, thereby promoting the use of these devices. While networking and security protocols will also become necessities, CMDs have the potential to significantly enhance the care delivery process. EMRs along with CMDs can build up a more efficient clinical decision support system to help monitor patients and improve the quality of care. Electronic alerts can be generated and documented to assist medical staff in providing real-time care while avoiding clinical oversights. CMDs can also help patients by enabling connected care at home, reducing the amount of cost and hassle associated with monitoring visits. Device interoperability is the key to the future of quality connected care. I often wondered why physicians spend thousands of dollars on purchasing electronic health records (EHR)? When I discussed this with an EMR analyst, I finally got my answer. Simply put, they purchase these systems in the hope of reducing costs, increasing efficiency and enhancing the quality of healthcare delivery. However, in order to achieve that, it is extremely important for physicians to be properly trained on the functionality of their EMRs. “Many physicians do not achieve the optimum results from EHRs because of the lack of expert training”, according to a New York based Cardiologist. Physicians should be provided expert training on a regular basis to assess their clinical workflows and specialty specific requirements. This would help in enhancing the clinical, administrative and financial efficiency of their medical practice. Unfortunately, extensive training is often overlooked as EMR vendors and providers just focus on the basics, given the cost and time associated with this exercise. The fundamental problem with EMR trainers is the expectation that physicians and other practice users have prior knowledge and basic understanding of computer systems. This results in an overload of information for physicians during their training. Ideally, rather than burdening physicians with comprehensive EHR training in a single go, the trainers should being with basic features and navigation of the solution before progressing towards in-depth technical knowledge. According to a recent study, a slow and steady approach for training leads to enhanced efficiency of a practice, and provides physicians with more time to attend their patients. Another important factor is the difference in the learning capabilities of individual users. It is pertinent to understand that although some care providers might learn certain techniques in just a few hours of training, others may need much more time. Today, a few established EMR vendors have a dedicated team of trainers for their clients. These trainers are well versed with the inherent difficulties during training because of the varying backgrounds of each individual. On top of that, EMRs can be conformed to suit the unique workflow of each physician. EMR vendors have now started to focus on the development of specialty specific EMR solutions for this very reason, and the fact that it helps reduce the amount of training required. With many physicians still uncertain about the Meaningful Use requirements, EMR training should be more focused towards the assessment of every user along with a simplified approach towards Meaningful Use compliance. Training is an integral part of the implementation of any EMR system and must be given utmost attention by vendors and providers alike. Ever since the public release of the proposed rules for Meaningful Use stage 2, concerns regarding EMR capability to share and expedite medical information and workflow across multiple health organizations and platforms have been mounting consistently. The concept of an Accountable Care Organization is to provide efficient, effective and affordable healthcare. By creating a platform for sharing information across multiple health organizations the healthcare community can enhance medical response time and care delivery. While ACOs are slowly emerging in forms of large hospital alliances dedicated to change through technology utilization, smaller practices with scarce resources are increasingly becoming endangered. Large medical groups are progressively developing integrated health networks by deploying resources to create sustainable technology that enables clinical collaboration. Small organizations simply cannot afford to dedicate the time and resources necessary in developing such technology and hence most are dependent on their EHR vendor to provide a linkup to the HIE. However this does not work for everyone and although HIE development has significantly improved over the years, connectivity is still limited at best. While many choose to blame EMR, issues like data security and information exchange protocols are seldom acknowledged. Communication and clinical information sharing are two of the most important questions in the healthcare community at the moment. However once the technology does break through, the situation is likely to change. What would happen when ACO partner organizations effectively start sharing confidential clinical data? Information is likely to pass through several other connected organizations that may lack HIPPA compliant systems or their staff may just not be trained to handle such sensitive information securely. Digital information transmission exposes the organization to several security risks. While hosted solutions may be able to provide some level of security, the provider is not relieved of their responsibility towards safeguarding and protecting client information. EHR interoperability is definitely necessary in developing ACOs. However the focus should not just be on the technology itself, but on developing the right environment for it to flourish. Embedding a culture of responsibility within the healthcare community is the first step for enabling a successful transition towards Accountable Care Organizations. Implementing an EMR is quite similar to buying a car. The sticker price might be $12,000, but once tags, insurance, warranties and other incidentals are added, it’ll take at least $16,000 to get it out of the lot. And it will take more than $30,000 over the next five years to keep it on the road. Similarly, many practices think the price quoted to them by their electronic medical records (EMR) vendor is the total amount that EMR implementation is going to cost the practice. And then reality sets in. However, several practices are discovering that cloud-based systems, which eliminate the substantial cost of installing and maintaining on-site servers in the office, can be less expensive. But analysts suggest that even those require careful consideration based on cost and necessitate that a practice set a budget before signing a contract. With cloud-based systems, the budgeting is not just about up-front cost; it is the cost incurred over the next few years which needs to be properly allocated. For the purpose of choosing a suitable EMR solution, many practices hire consultants to help them through the selection process or request-for-proposal processes. The consultants also guide the practices through the rest of the budgeting tasks. With cloud-based EMRs, a practice is wholly dependent upon their internet connection. Practices should choose their local broadband service not just on the cheapest price, but for the most reliable service. They may want to consider implementing multiple broadband connections; one DSL, one cable so there is a backup if one goes down. Additionally, prior to the implementation of an EMR system, clear objectives should be established, and practices need to determine the future costs of meeting them. Practices wishing to qualify for meaningful use incentives, for example, eventually may participate in a health information exchange that requires new software applications or even membership fees. The lifespan of existing hardware would also need to be considered. Most desktop computers become obsolete every three to five years. In a nutshell, the primary focus while establishing an EMR budget should not just be about reducing costs and saving time, but improving the overall quality and safety of healthcare delivery. Physicians have a lot to consider but when objectives, expectations and possibilities are clearly identified beforehand, the process of selection is a lot more simplistic. 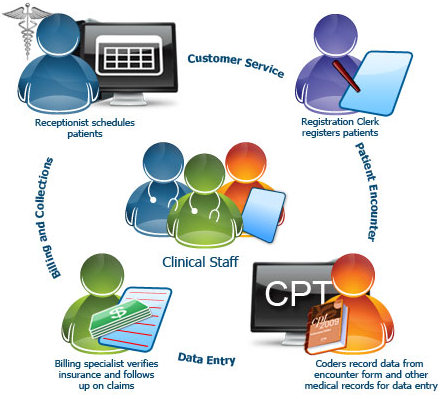 Electronic Medical Records or EMR is one of the hot topics of discussion within the healthcare industry. Like many industries, information technology has also influenced the healthcare sector. Today, it would not be absurd to assert that technology aids the doctors to save lives along with streamlining their clinical operations. According to a research, U.S physicians are replacing their conventional documentation methods with EMRs. Having realized the accuracy, efficiency, and quality of documentation with EMRs, hospitals and various medical laboratories are trying to replace paper with computers..Recent development in EMR solutions has meant that “going paperless” is now one of the least important benefits of this technology. Collaborative care management, built-in interaction checks, audit trails and health maintenance alerts have addressed the need of the hour and helped physicians provide better quality care to their patients. If these advantages weren’t alluring enough, the government’s promotion of EMR(s) certainly helps raise physician interest. Yes, I am talking about the financial incentives associated with the adoption of an EMR. With more than $14.4 billion already provided to over 76000 physicians, it is high time to realize that an EMR has become an asset for physicians. After all, having an opportunity to earn thousands of dollars by merely complying with specific standards aimed at raising quality and awareness is not a bad deal for healthcare professionals. Is it? I am certain that looking at an EMR as an investment opportunity is not an understatement. The financial incentives accompanied with reduced cost of paper, and elimination of administrative hassle make EMR one of the finest investment instruments for healthcare providers. However, implementation of EMR is a tedious job because many physicians are edgy when making this technological commitment or they are simply unaware of the benefits of adoption. However, Regional Extension Centers and a few EMR vendors have done a decent job of helping providers evaluate the various options at their disposal along with their pros and cons. RECs are government funded bodies whereas, EMR vendors are trying to offer more in order to remain competitive in the market. Many established EMR vendors are now offering FREE consultation, assessment and demonstrations to help providers feel more comfortable. There are always going to be those that support the promotion and adoption of EMR technology whereas, there is no shortage of those that find such technological advancements futile and feel that technology depersonalizes the patient – physician relationship. But let’s look at the brighter side of the picture. The benefits of using an EMR, for both the physician and the patient; outweigh the costs of switching to this new automated system. Physicians who are willing to spend thousands of dollars on these EMRs would be satisfied knowing that an EMR not only saves the time required to document a clinical encounter but also reduces the hassle of paperwork. It allows for utmost accuracy and un-aging documentation. Of course, one cannot forget about the preventive care features helping in reducing fatal drug interactions. With an EMR, patient safety becomes inevitable. A patient is another side of the same coin, and fortunately these solutions make life easier for the patients too. After all, a secure online link between a physician and their patient would not have been possible without EMR systems. As a proponent of this technology, I am certain that EMRs are on the rise and with the passage of time they would provide the healthcare industry with unlimited possibilities.